Published on 25 January 2007. I'm not a believer in brushing the past under the carpet. I've written some offensive rubbish on here in the past: deleting it and pretending it never happened doesn't change that. I hope that stumbling across something that's 12 years old won't offend anyone anew, because I hope that people can understand that what I thought and felt and wrote about then is probably very different to what I think and feel and wrote about now. It's a relic of an (albeit recent) bygone era. My views may well have changed in the last 12 years. I have written some very silly things over the years, many of which I find utterly cringeworthy today. Monday’s edition of The Guardian’s famous (and hugely successful) series of wallcharts has, it would seem, succombed to Grauniad Fever. Of the forty breed featured, the names of six were spelled incorrectly, and the classification of one was wrong. That gives an 82.5% accuracy rate – not brilliant for an educational wallchart. This 1,048th post was filed under: Media. Comment posted at 19:25 on 25th January 2007. 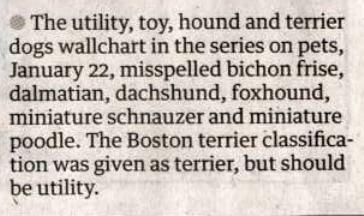 No, Simon, I was not hired as the person in charge of spelling the dog breed names, honest.